Many people in the world are addicted to certain types of foods that are rich in sugar, salt and fat. Theses persons are experimenting a desire to eat more food to numb the uncomfortable feelings. This behavior is called food addiction and might contribute to the obesity epidemic. Also the excessive food consumption has been recognized to show similarities with substance dependence. The term food addiction was first introduced by Theron Randolph in 1956, however the publication about this concept has not started until 2009; although the term food addiction created controversy in the scientific community, the evidence of being addicted to food has been increasing over decades; food addiction hypothesis suggests that a person can be addicted to certain types of foods that are rich in sugar, salt, fat and the person displays addiction-like symptoms in respond to some food . Food addiction is a vicious cycle of unhealthy eating, which brings on a sense of being hopelessly out of control, which brings on a desire to eat more food to numb the uncomfortable feelings. 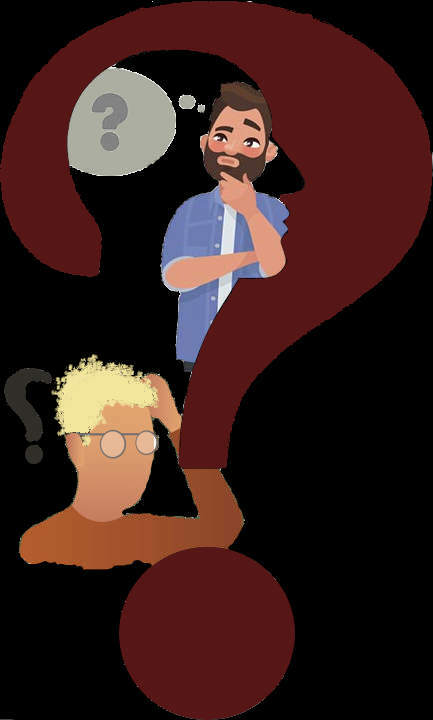 Impulsivity is an important trait to focus on in terms of addiction and usually it has connection with many psychological problems; impulsivity can be defined as behaving without decent thinking, acting without planning and/or ignoring possible unpleasant outcomes, for instant pleasant outcome. Though the term “food addiction” does not differentiate which foods may be associated with addictive-like eating, the construct posits that certain foods with added fat and/or refined carbohydrates like white flour or sugar (e.g., pizza, chocolate, chips) may uniquely activate the reward system in a manner similar to drugs of abuse, which may trigger problematic eating behavior in susceptible individuals; thus, existing evidence suggests that behavioral responses (e.g., diminished control) implicated in addictive disorders are most associated with high-fat, high-sugar foods in humans, though additional research is warranted to understand variability in food overconsumption under extreme circumstan. 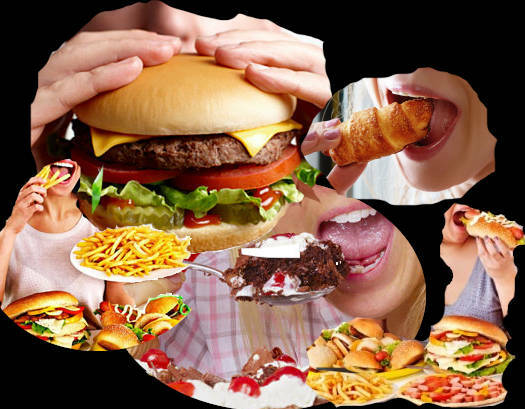 Excessive food consumption has been recognized to show similarities with substance dependence. Subsequently, it has been proposed that food addiction might contribute to the obesity epidemic. The incidence of food addiction is comparable to that of cocaine addiction (i.e., about 10–15% of people or drug users, respectively) but considerably increases in patients with obesity. Both food addiction and substance dependency activate the same brain regions as well as the same neuroal circuit. Kim (2014) found that excessive food consumption might activate neural adaptation in reward circuitry, similar to drug and alcohol dependency; Impulsivity is an important trait to focus on in terms of addiction and there is a connection with many psychological problems; impulsivity can be defined as behaving without decent thinking, acting without planning and/or ignoring possible unpleasant outcomes, for instant pleasant outcome; a study revealed that food addiction increases the body weight and the severity of obesity from normal to obese individuals in the general population. In another hand, there exist clear behavioral, psychological, and neurobiological commonalities between palatable foods and drugs of abuse in both animals and humans; moreover, obese individuals appear to exhibit neurobiological indicators associated with substance dependence. Schulte, Erica M. et al. 2016. A commentary on the “eating addiction” versus “food addiction” perspectives on addictive-like food consumption. Elsevier. Ahmed, Serge H. et al. 2012. Food Addiction. 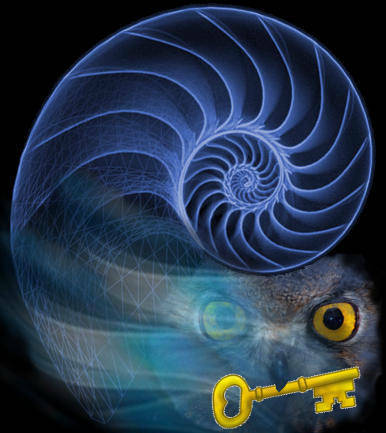 Springer Science+Business Media LLC. Jay, Katie. Food addiction and the Weight-loss Surgery Patient. Meule, Adrian. 2012. Food addiction and body-mass-index: A non-linear relationship. Elsevier Ltd.
Foods at the top of the Eidos diet pyramid should be avoided. These foods are responsable of malnutrition, obesity, nutritional diseases and also they are causing food addiction. 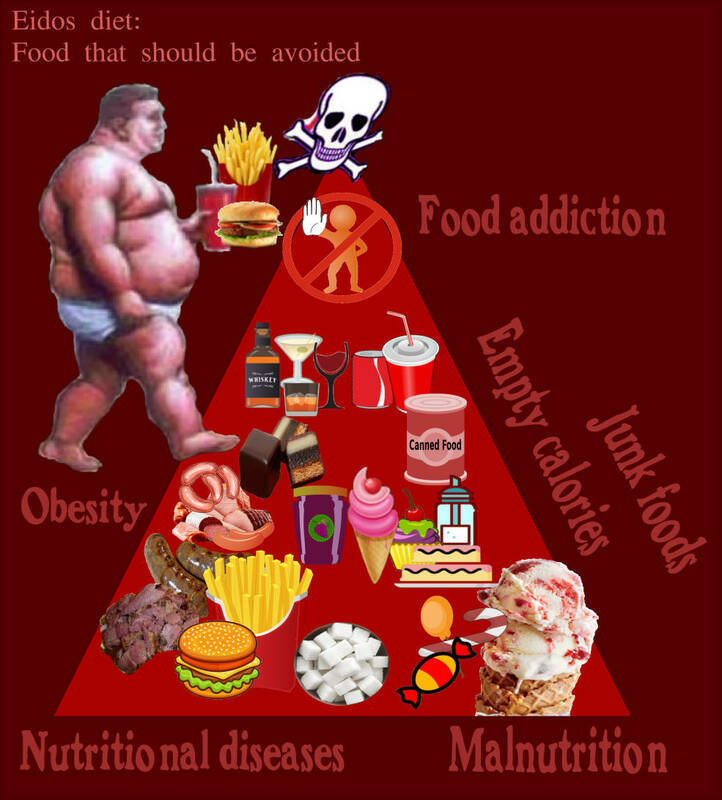 In the red triangle at the top of the pyramid of the Eidos diet are the unhealthy foods that should be avoided because these foods have a negative impact on health and quality of life. The main unhealthy foods include sugar, starchy foods, foods with added sugar, pastries, ice cream, candies, salty foods, smoked foods, foods high in saturated fat, trans unsaturated fats, fried foods, sausages, hamburgers, junk food, industrial canned foods, alcoholic beverages, and soft drinks. All these foods are responsible for leading to obesity and diseases associated with obesity and malnutrition since they are foods with empty calories. Their frenquently consomption can cause food addition and also they are responsable of nutritional diseases. Although natural fruit juices contain nutritional values, they are not recommended to drink because it is necessary to squeeze several fruits to fill a glass and as a consequence the fruit juice has a high content of simple natural sugars that are not good for health. It is better to eat a whole fruit. 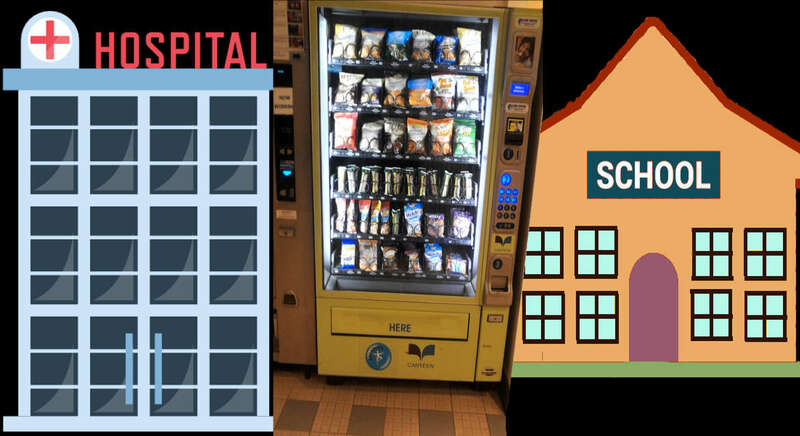 Is it possible to teach and convince people to change their nutritional behaviours by choosing and eating healthier foods when vending machines are installed in many hospitals and schools in North America? Despite obesity is increasing and people need to be encouraged to change nutritional behaviors, in North America there are many hospitals and schools where there are installed vending machines providing high proportion of unhealthy foods. As it is well know, the majority of foods and beverages in vending machines are high in calories, fat, and sugar. Both, hospitals and schools should be the places where people should be strongly encouraged to make healthy choices. To convince and help people to change their nutritional behavior by selecting healthier foods, the actual vending machines should be removed or their unhealthy products should be replaced by healthier foods such as packs of cheese, yogurt, olives, dried fruits, nuts, seeds, and products with nutritional value without added sugar. Also Soft drinks should be replaced by water and tea bottles without sugar. Over the last few decades, obesity rates among children in the United States have increased dramatically. Factors in the social and physical environments are increasingly recognized as influential on the precursors of obesity: overweight, poor nutrition, and physical inactivity. Hospitals and health care facilities are among the environments that could potentially influence children’s health and their adoption of healthy lifestyles. Many health case institutions or facilities provide environments that may not support the adoption of healthy nutrition habits. In the school when less-healthy snacks and beverages are available in schools, children consume more fat and sugar and less fruit, which can contribute to childhood obesity. School vending machines provide a convenient way for children to purchase these less-healthy snacks and beverages. In the facilities where there are vending machines with unhealthy foods people are forced to buy them when the cafeteria and the canteen are closed. Also it is a bad example for teaching and convincing people that they should change their nutritional behaviors by choosing and eating healthier foods. Lawrence, Sally et al. 2009. The Food and Beverage Vending Environment in Health Care Facilities Participating in the Healthy Eating, Active Communities Program. PEDIATRICS Volume 123. Park, Sohyun et al. 2010. The Impact of the Availability of School Vending Machines on Eating Behavior during Lunch: The Youth Physical Activity and Nutrition Survey. Journal of the American Dietetic Association. Empty calories are called food that are rich in calories and hight glycemix load. In these foods vitaminis and minerals are absent or in very few amounts. Some foods may contain abundant calories but they are containing only few nutrients per calorie. Usually “junk foods” may be described as sources of empty calories. Empty calories is applied to foods and beverages composed primarily or solely of sugar, fats or oils, or alcohol-containing beverages. Vitamins and minerals are absents or may be presents only in very few amounts. Sugar, candies, soft drinks, cookies, beer and wine are some examples of foods with empty calories.